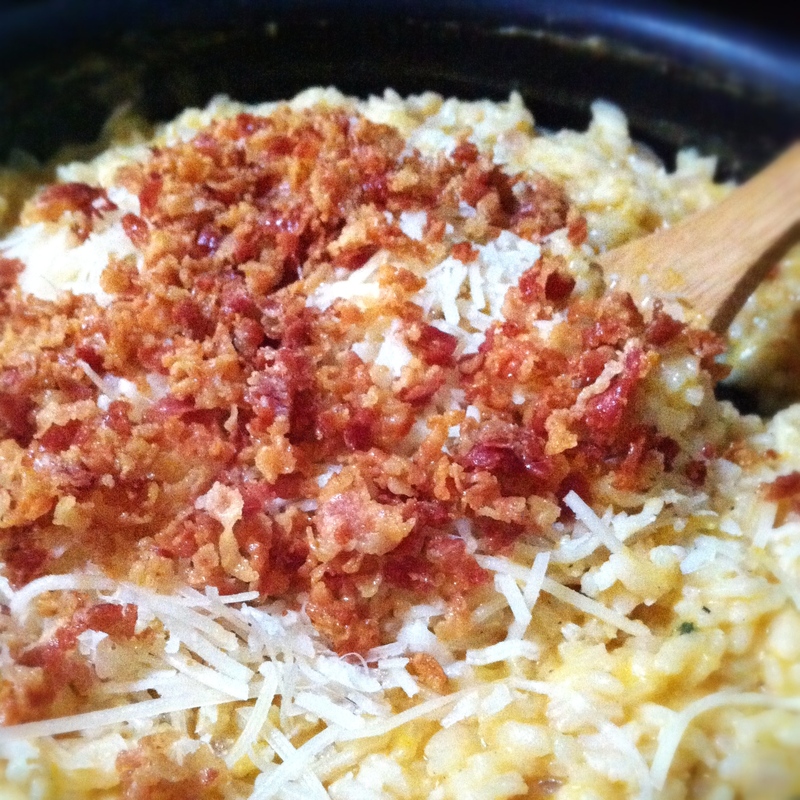 butternut squash pancetta risotto cakes | omfg. so good. 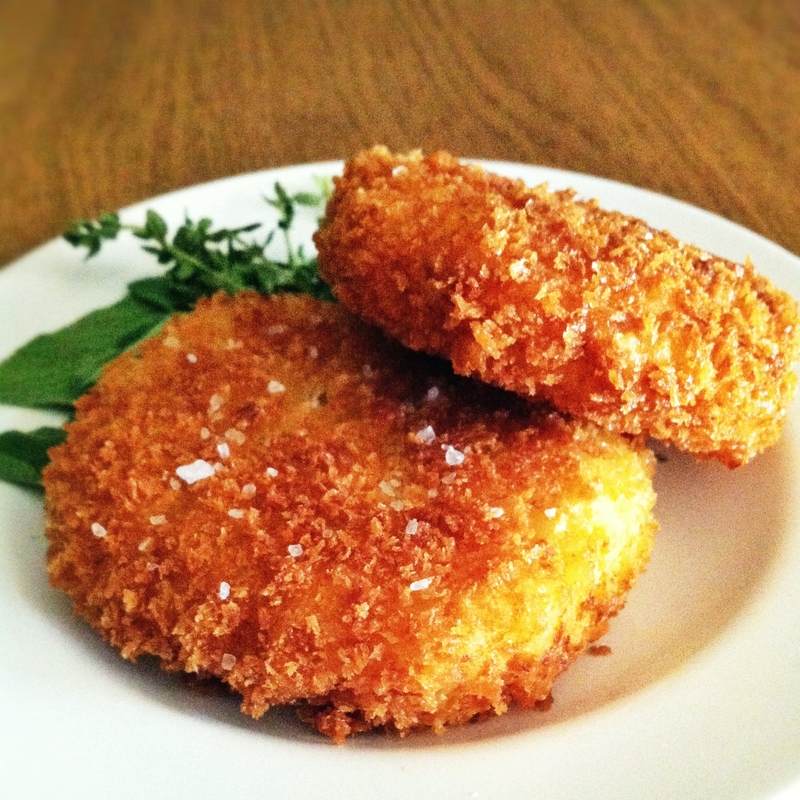 Butternut Squash, Sage & Thyme Pureé AND Butternut Squash & Pancetta Risotto Cakes. Preheat oven to 400 degrees and line a baking sheet with parchment paper. (I should really consider investing in parchment paper, btw.) Cut the squash in half lengthwise and scoop out the guts and seeds. Arrange on the prepared baking sheet. Pull the thyme leaves from the stems and sprinkle in the squash, drop in the sage leaves. Place the sheet pan in the oven. 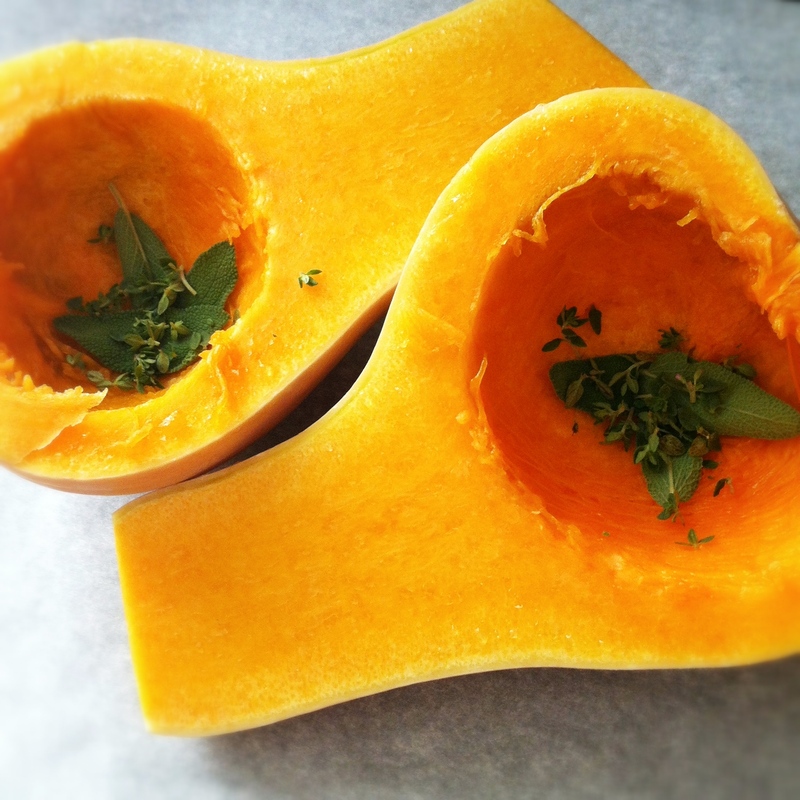 Roast for 45 – 50 minutes or until the squash is fork tender. Remove from oven and let cool on pan on wire rack to room temperature. 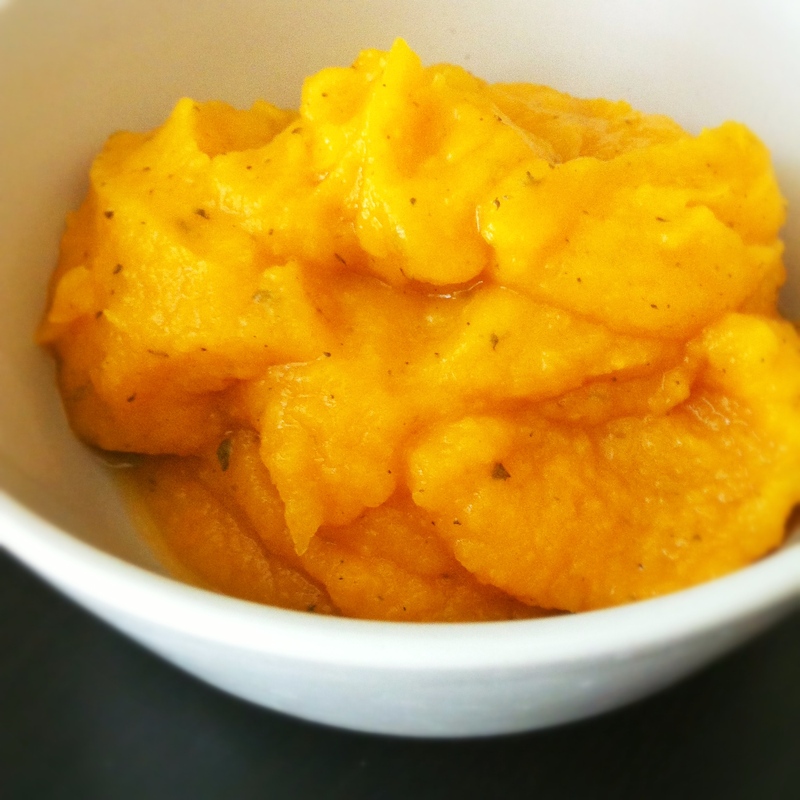 Scoop out the squash & herbs and throw everything in the blender. Pureé to desired consistency. Refrigerate or freeze in ice cube trays or covered baby food trays for future use. Chonker Baby ate this right up. But then, I think he would eat pretty much anything he could get his little pudgy hands on. Remember the dog food incident? I do. So, I made the pureé in the morning before I left for work. That’s how easy it is. Then when I got home in the afternoon the real fun started. 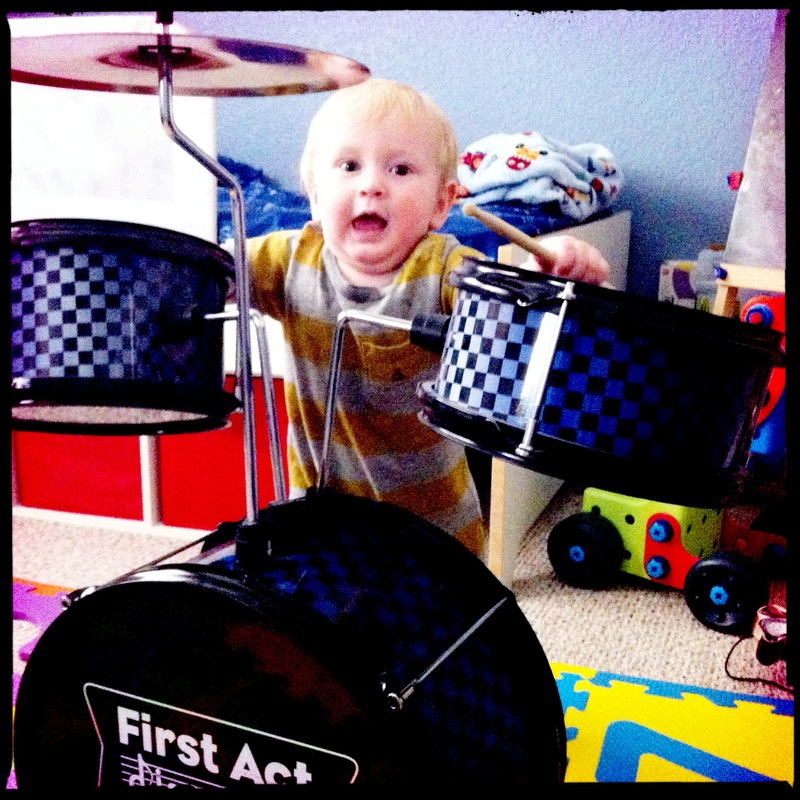 Have you ever tried making risotto while corralling a 10 month old who desperately wants to get his mitts on his brother’s drum set? Not an easy feat, my friends. Thankfully, Picky Eater indulged him for a few minutes while I got the prep work out of the way. Risotto: In a medium saucepan over medium/high heat, bring chicken stock and water to a simmer then reduce heat to low. In a large skillet, cook diced pancetta to crisp then transfer to a paper towel to drain excess grease. In the same skillet, saute onions and garlic to transparency then add arboreo rice to toast (2 – 3 minutes.) Add white wine and continue cooking for another 2 – 3 minutes or until wine is completely cooked out, stirring occasionally. Ladle in the preheated chicken stock/water gradually, two ladles at a time, and allow to cook out completely before adding additional. The total cooking process is around 18 – 20 minutes from the time of the first addition of liquids. Add in the squash pureé when there is around 3 minutes left of cooking time and stir to combine. Add in the butter, nutmeg, parmigiano and cooked pancetta. Stir to combine. Now, you could technically stop here and just fill a giant bowl with risotto and dig in. Of course I had to take it one step further. Set up a dredging station with the two eggs (whisked) in one dish, flour in a second dish and panko in a third dish. 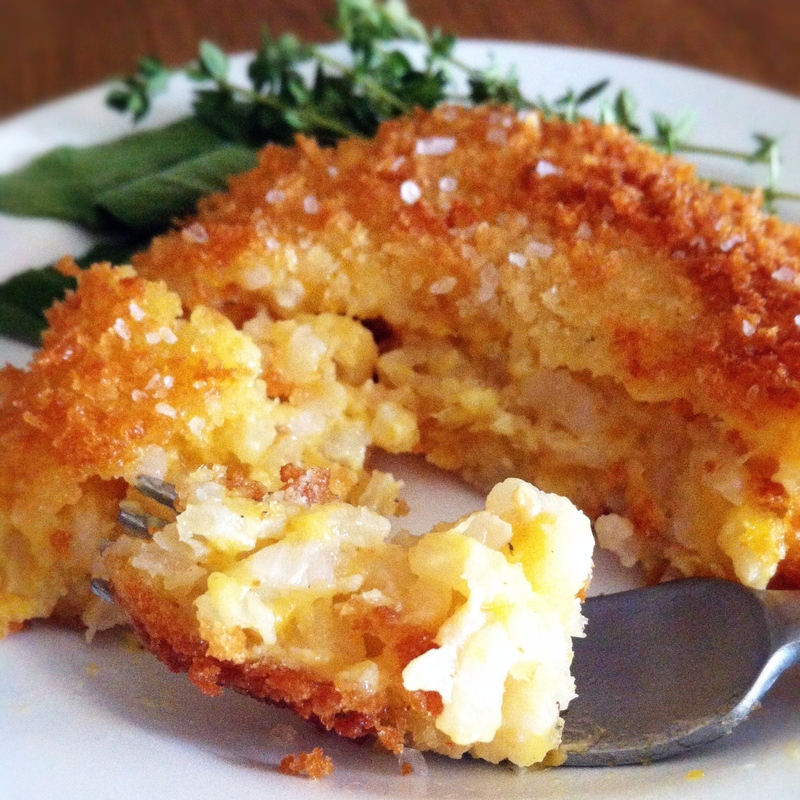 Form small round patties/cakes with the chilled risotto (around 3″ diameter, 1″ thickness) and set aside. Begin coating by dipping first in the egg, then the flour, then the panko. Set the breaded cakes aside and heat up oil in a large skillet. Fry the cakes to a nice golden brown hue then transfer to wire racks over a sheet pan. Putting them on wire racks while they’re still hot from the oil allows the air to circulate around them and helps to keep them crisp. Sprinkle with a bit of coarse salt. Now, make these and eat them. Water?? There is no mention of water or how much to combine with the broth, I am anxious to try this recipe but am a little confused. Omg, what a flake i am. 2 cups of water. Sorry, updating this right now!! !